If you're an Android Smartphone owner and loves to download and install every single app from Android Market than you must have to know about the Most Popular and Best Applications of Android Market that worth download. Android Market is mostly known about its own integrated apps which are made from Google, but there are also popular third party applications available on Android Market which is quite useful for users to use it in daily life. 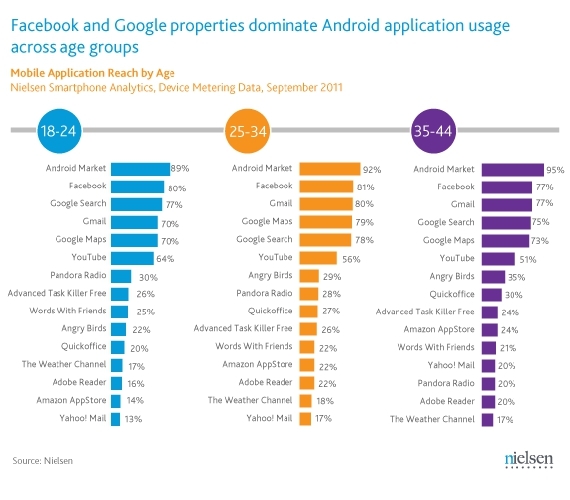 According to the latest survey report from Nielsen which summarizes the Top 15 Best and Popular Apps of Android Market sorted by user age groups from 18 to 24, 25 to 34, and 35 to 44. 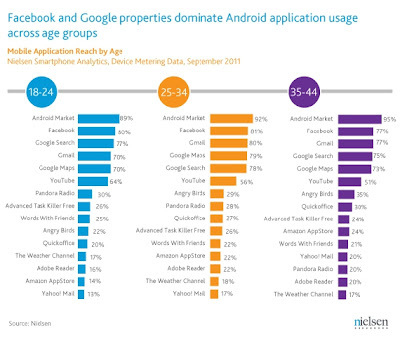 The following chart shows that Android Market Application is most popular amongst all age of peoples and then Facebook is on number second position as Most Downloadable App of Android Market and after that you can see 3rd, 4th, 5th and 6th position is hold by Google made applications.